If the first key involves turning inward, the second key looks outward at our family and the goals we wish to create for the group as a whole. If we’re more familiar with our personal history related to food and eating, we can better consider the important values for our family. Perhaps we are looking to forge a new path from how we were raised, or improve upon values that were passed down. In either case, determining what’s important for the family will impact how our children eat and form their values about food and eating. – What are the three most important food values for me and my family? – What are steps I can take to improve family meal times? – Do I need resources to assist me in this process? – In an ideal world, what do I want my child’s eating to be like? – Are my family goals realistic? The above questions can move us along the path to not only investigate what’s important and why, but into action and taking steps to make changes. Discuss these questions with your spouse, loved ones and other family members. Search online and visit the library for some excellent resources on ideas for improving family meal time, menu planning, and organizing your kitchen. Work on one goal at a time rather than trying to overhaul your system with sweeping changes. If your goal is to have more family meals together, don’t forget about breakfast and weekend meals. Dinners together are wonderful, but often a challenge due to busy schedules. 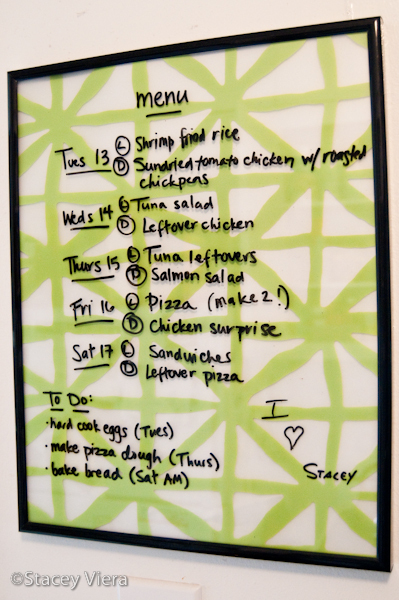 With a menu planning goal, make a plan for a certain number of meals cooked at home per week and build from there. For those accustomed to eating out, cooking at home can feel overwhelming, especially when we’re tired. If you’d like your child/children to try more new foods, get creative with your variety as well as how the foods are served. It’s the repeat exposure that’s most important in the long run. What are your goals for you and your family? I love the questions you listed. Thought provoking! I try to work at least one veggie into every meal/snack (fruit at breakfast). It’s also a goal to minimize eating out. We try to keep it to 3 meals or less per week. It’s tough, but good for wallets and waistlines. Glad to know you found the questions thought provoking. I like your goal to eat out less often and have been working on the same. Good luck to you! My mom was home when we got back from school, but left for work again, usually by 5:30. She made sure we ate dinner before we left for two reasons: 1) she didn’t want us to choke while she was gone. 2) she didn’t think we should have a snack after we arrive home from school, because if we’re famished, we should just eat dinner then! She never made us anything at home that she wouldn’t eat herself. She didn’t blink an eye when I stopped eating meat around 10; it wasn’t an issue. I’m not sure she actively thought about the questions or topic above, but she implemented a method that worked to create lifelong balanced, adventurous eaters.